Since the very first day, Phoenix Communications & Cabling has provided first-rate telecommunications services. Our experts are experienced and knowledgeable in many different systems and have the resources to accommodate any client requests. Many of our workers are certified and have security clearance. Contact us today to learn more about our telecommunications company in Macomb, MI. For over 25 years, our firm has provided state-of-the-art technology as a one-stop solution meeting business telecommunication needs. We are backed by a team that is passionately committed to providing outstanding customer service. As a telecommunications company, we offer free business IT consulting in order to ensure that you receive the best telephone and data network system for promoting your continued success. Due to client demands, we have also branched out into installing automatic standby generators, CCTV systems, and controlled access systems. 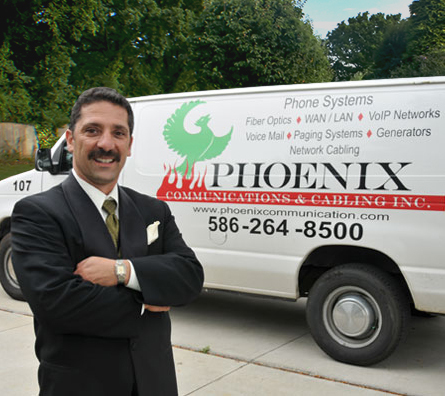 Phoenix Communications & Cabling, Inc.